Exterior vehicle antennas for cars and trucks include 4-inch and 12-inch size options and various mounting styles. An exterior antenna is required for all signal boosting systems to communicate with the cellular tower. The 12-inch, full-size antennas, regarded regular or full size, are more powerful, while the 4-inch, mini antennas offer a more compact, low-profile design. Typical 12-inch antenna will provide roughly twice the gain of its smaller counterpart. Both antenna sizes come in three mounting styles including magnet-mount, glass-mount, and NMO mount. Magnet-mount antennas utilize a very strong rare earth magnet which can mount onto the top of a vehicle securely while capable of withstanding the speeds of fast freeway driving. Glass mount antennas utilize two components, both of which use strong 3M tape to be mounted onto a window. The antenna itself is attached onto the outside of window glass and the receiver which is mounted onto the inside. NMO mounted antennas require the purchase of a separate NMO mount with three different options available. The 4-inch antennas come in three magnet-mount, window-mount, and NMO mounting styles. For magnet mount antennas, there is one with a FME-Female connector (301113) and the other with an SMA-Male connector (301126). The two magnet-mount antennas both include 10-foot RG-174 cables. Both of these magnet mount antennas are wideband meaning they can work for any cellular network worldwide. The glass-mount 4-inch antenna (301114) includes a 14-foot RG-58 cable with an FME-Female connector. The 12-inch antennas also come in three mounting options. 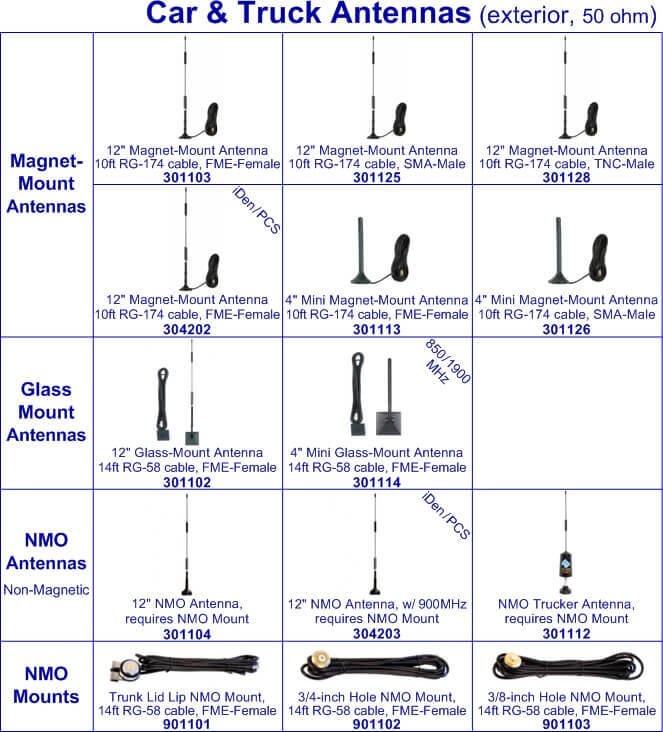 For magnet mount antennas, there are many in the 12 inch variety. These include the 301103 (FME-Female connector), 301125 (SMA-Male connector), 301128 (TNC-Male), and 304202 (FME-Female connector for Nextel/ iDEN). All of these 12-inch magnet-mount antennas include a 10-foot RG-174 coaxial cable. There are two glass-mount antennas which include the 301102 and 304201 (Nextel/iDen). Both of these antennas include 14-foot RG-58 cables with FME connectors. The NMO mount 12-inch antennas available include the 301104 and 304203 (Nextel/iDen). The NMO antennas can only be installed using specific Wilson NMO mounts which directly screw into the antenna base. The NMO mounts include the 3/8-inch mount (901103) requiring a 3/8 inch drilled hole, the 3/4-inch mount (901102) requiring a 3/4-inch drilled hole, and the trunk lid mount (901101) attaching onto the trunk lid lip. 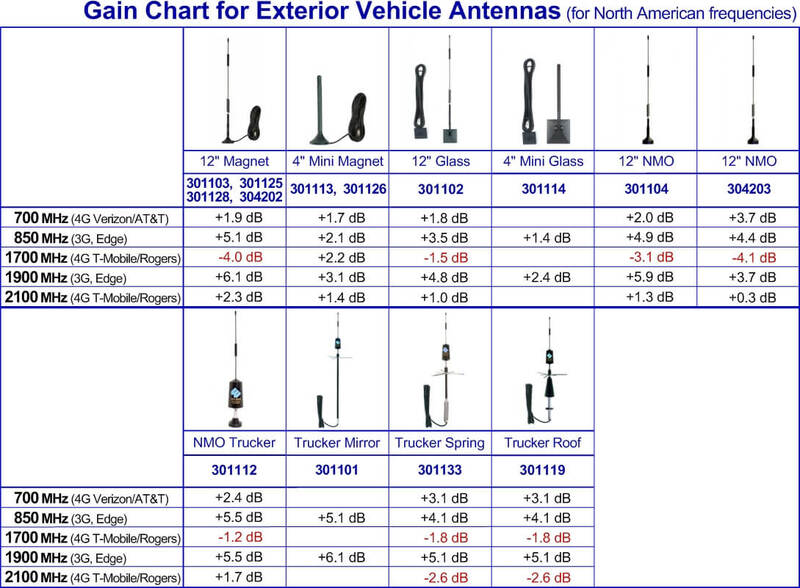 The following chart lists signal gains (in dB) for car/truck antennas. All of these antennas should perform well on most North American frequencies, including the common 850/1900 MHz.